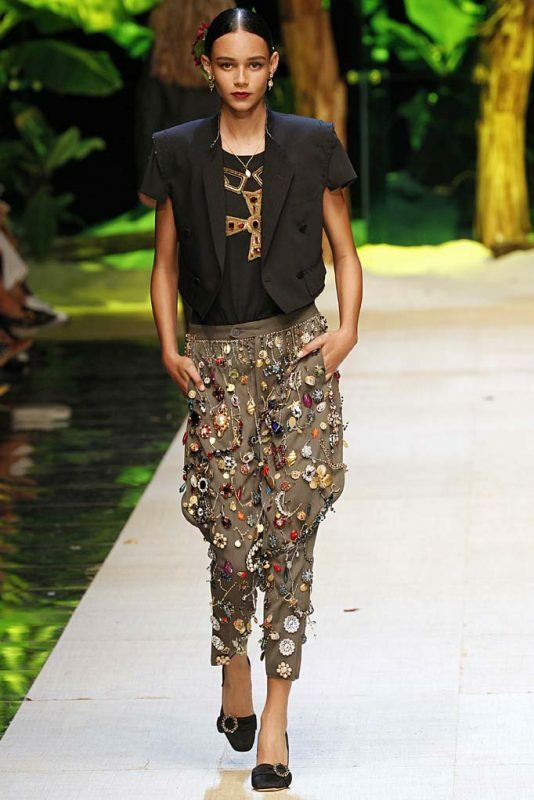 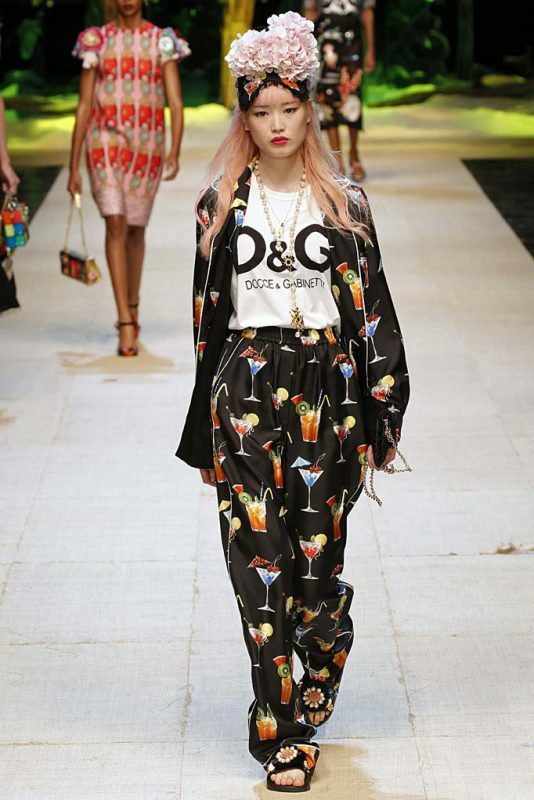 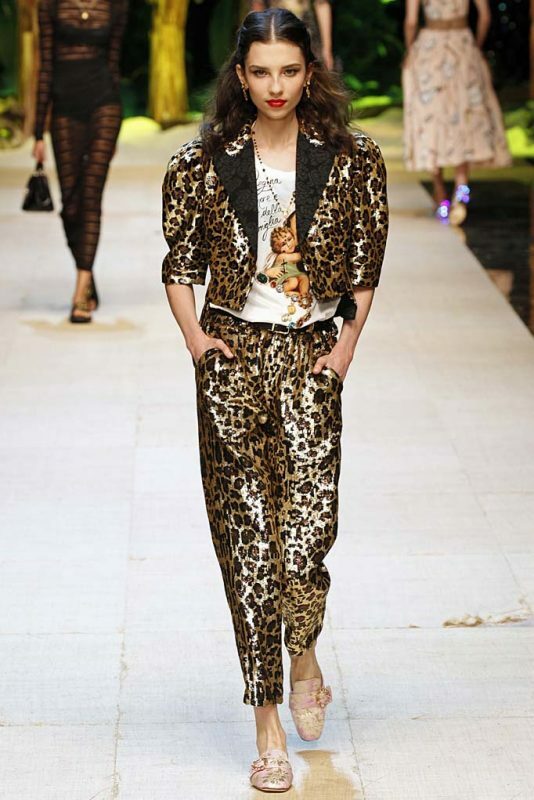 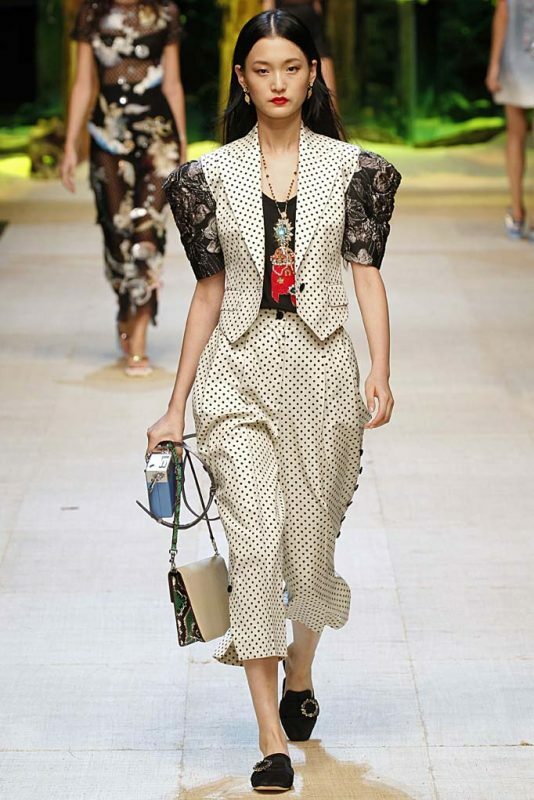 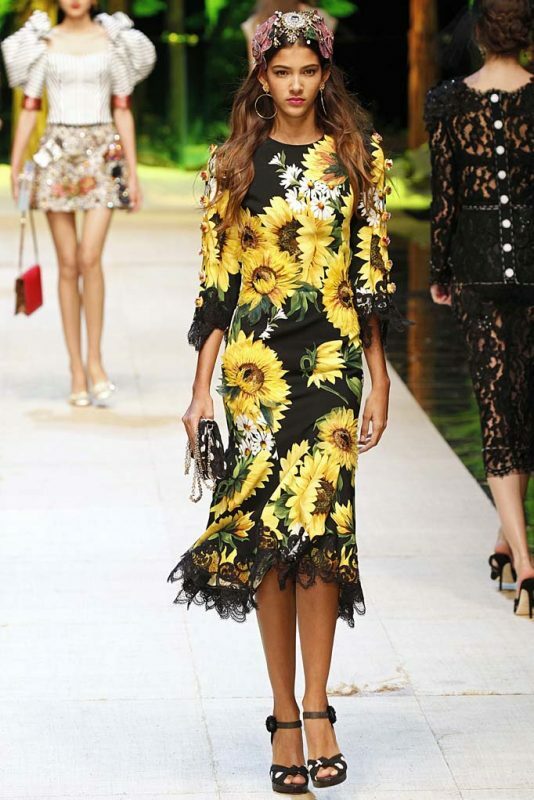 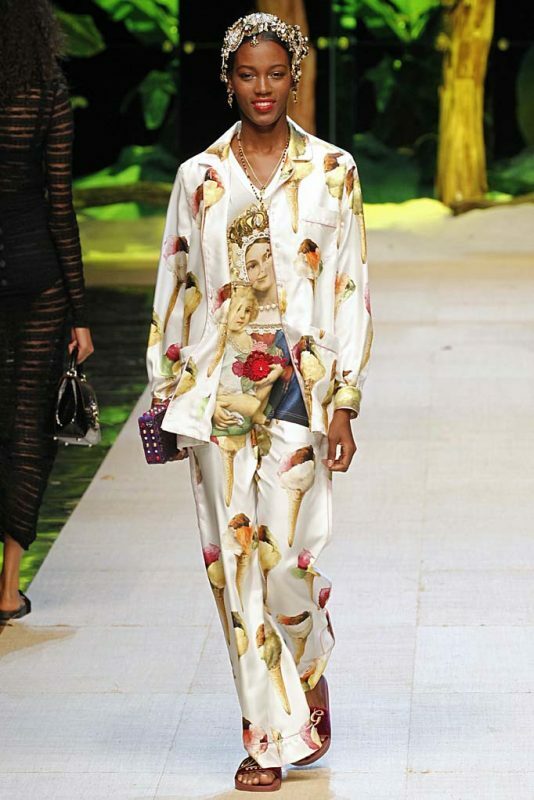 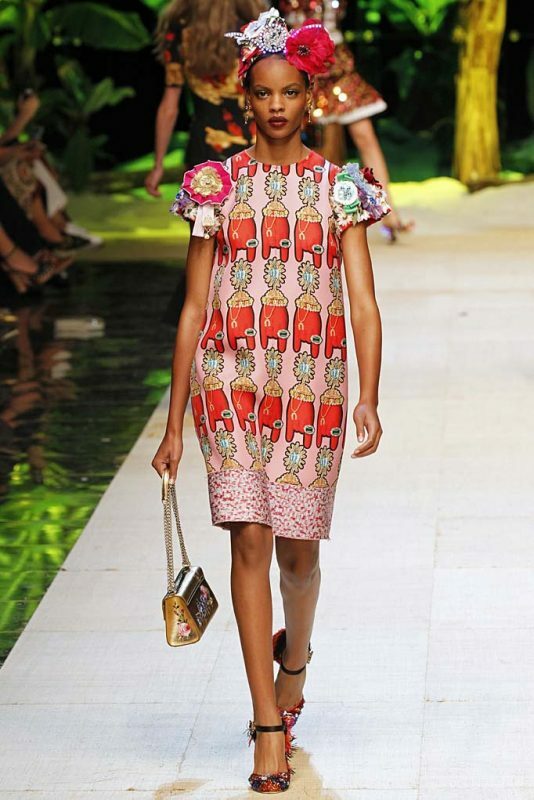 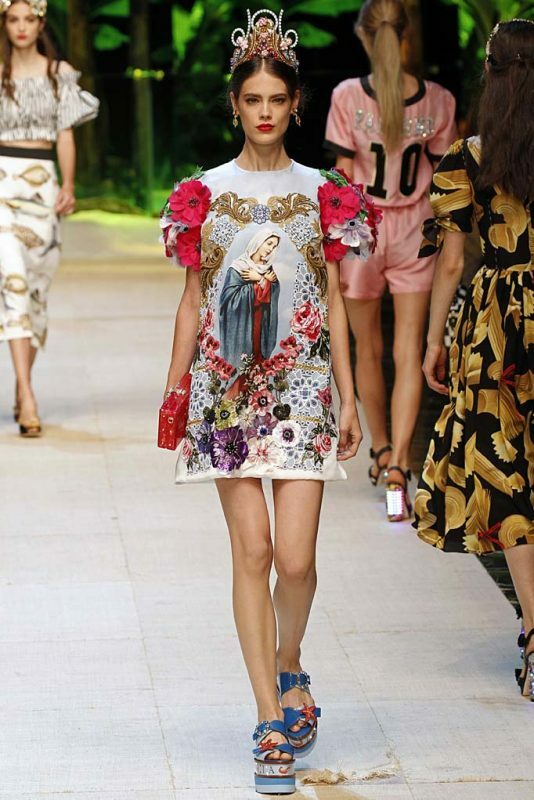 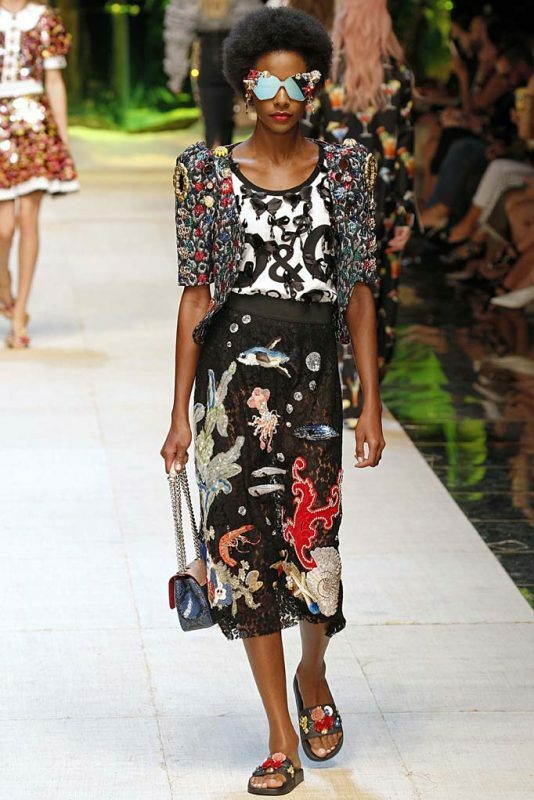 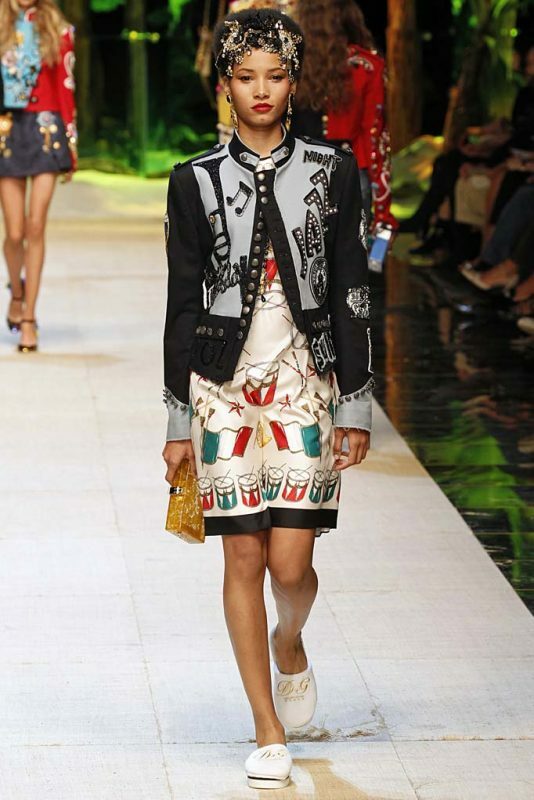 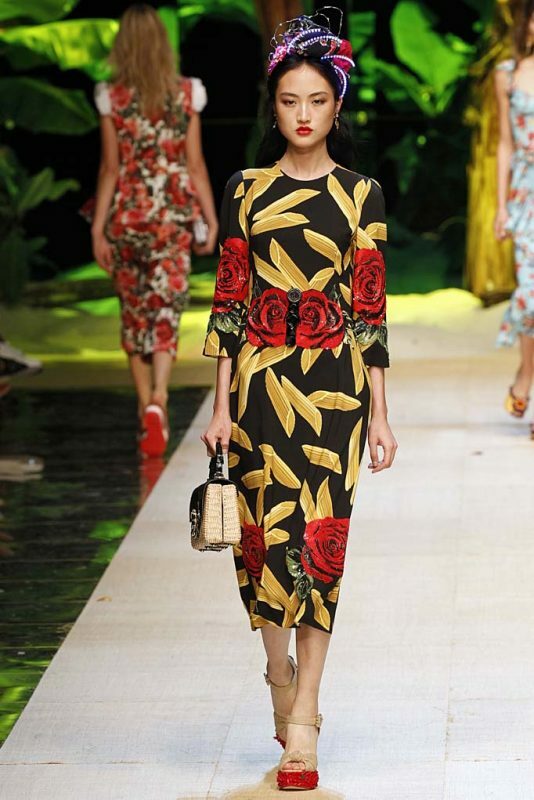 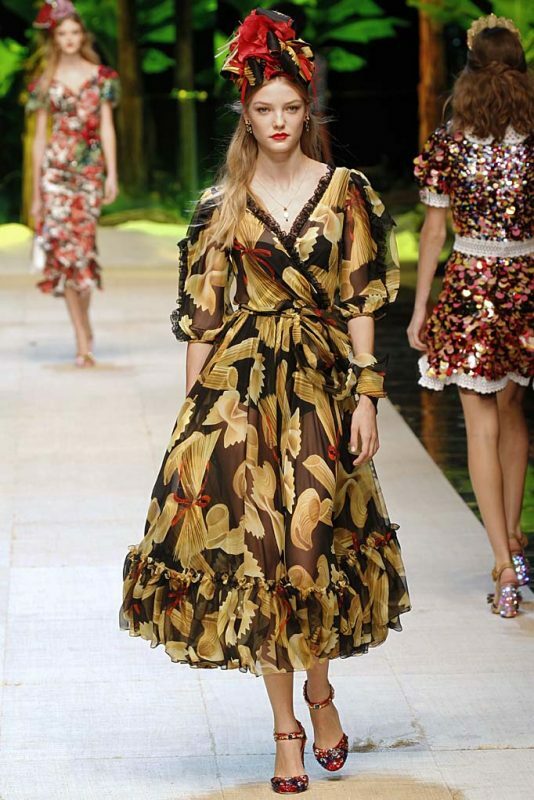 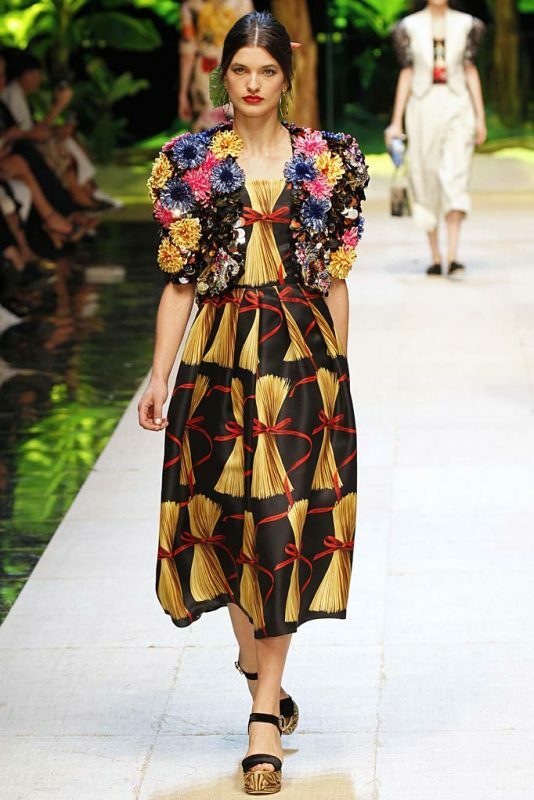 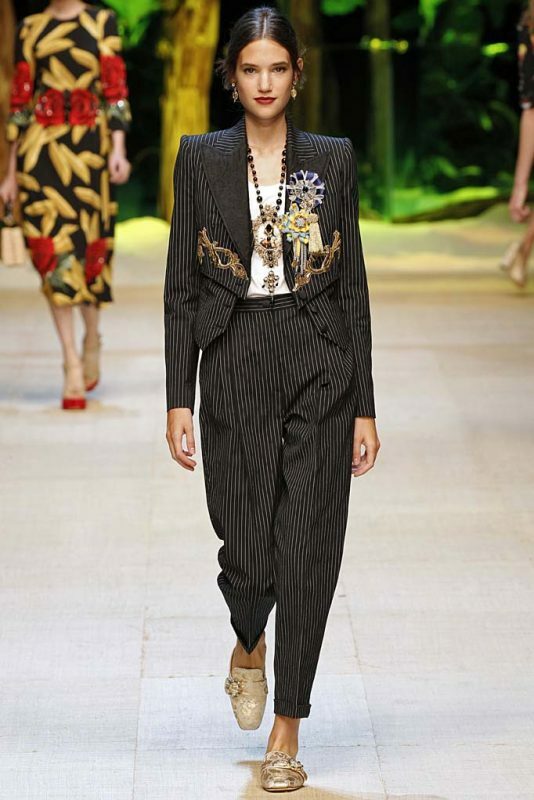 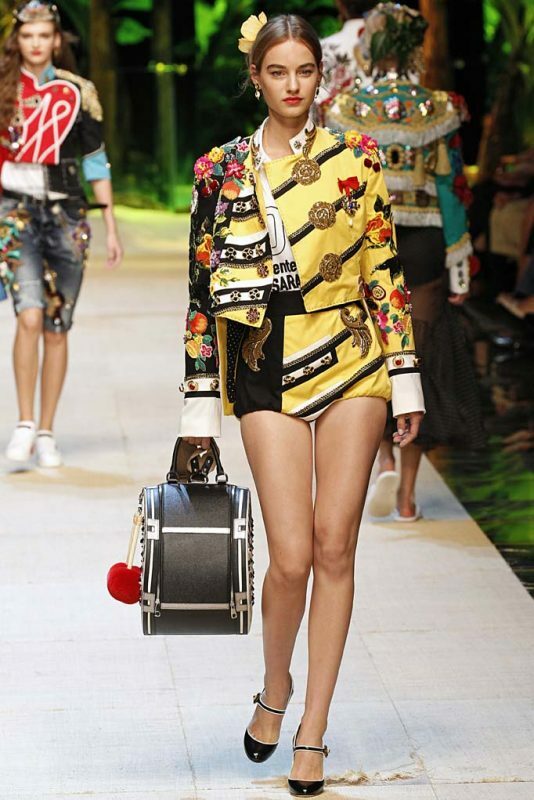 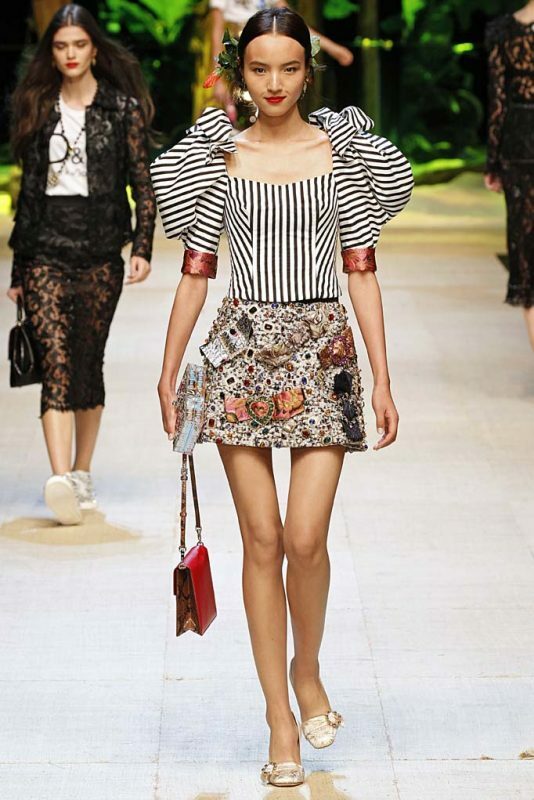 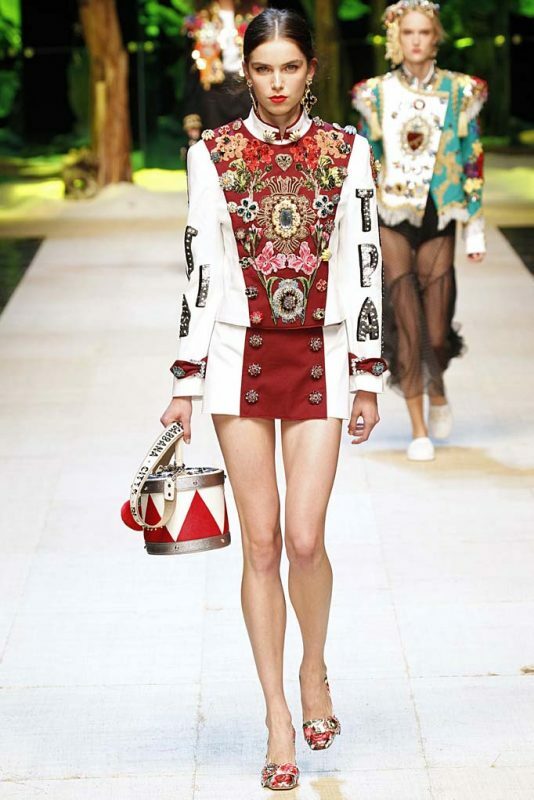 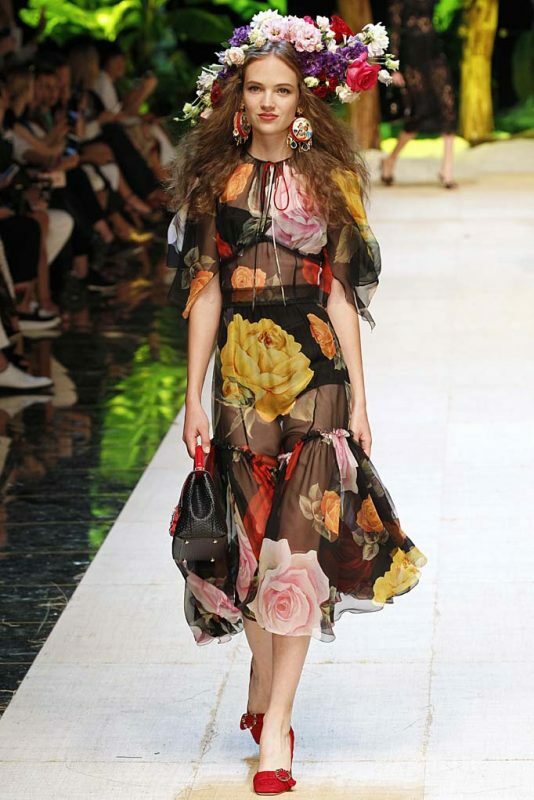 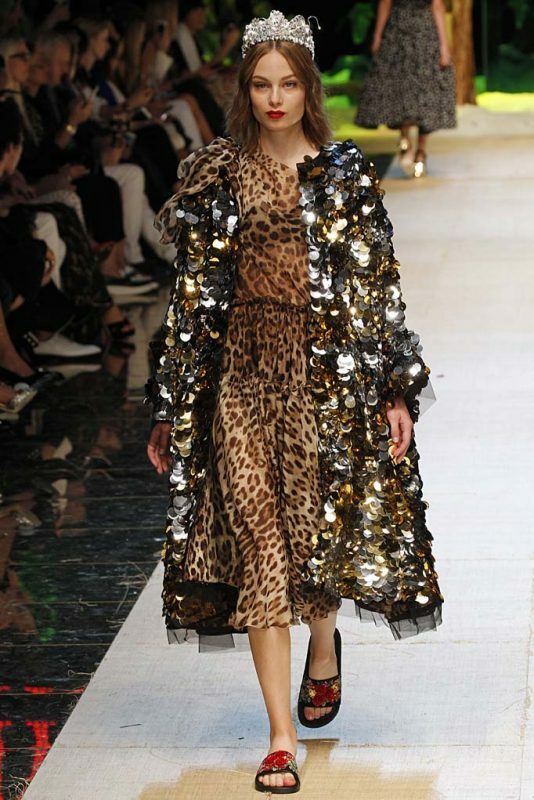 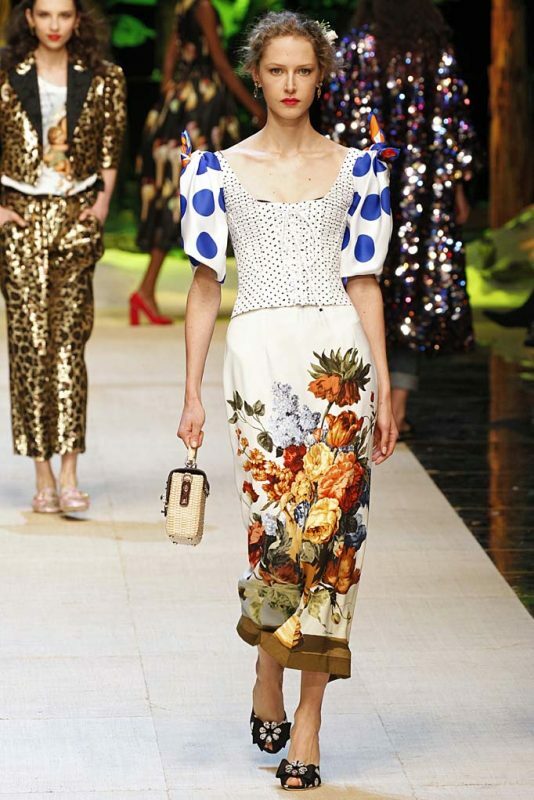 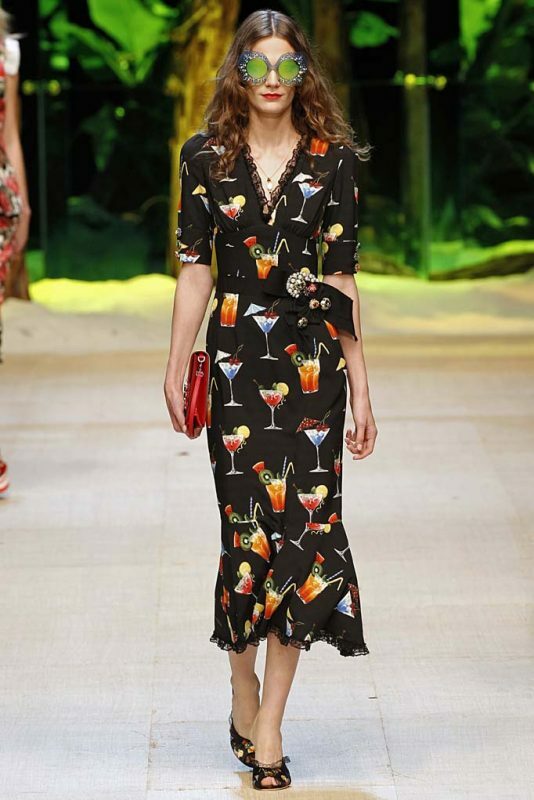 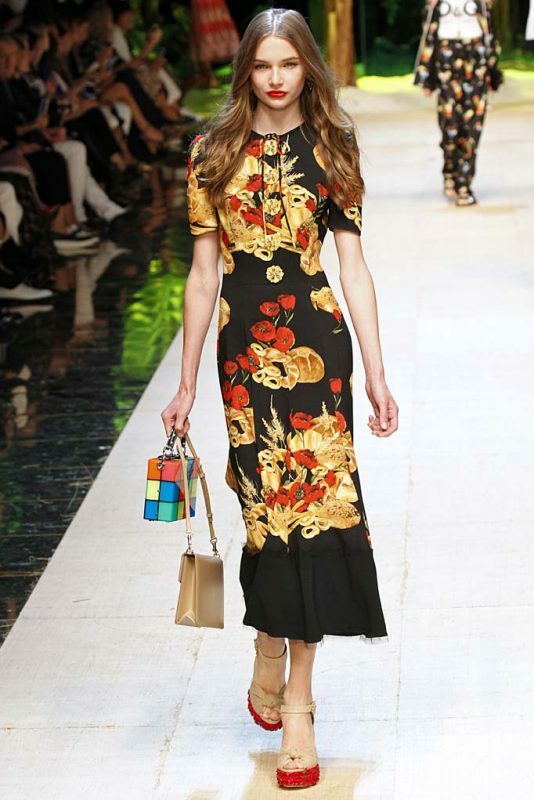 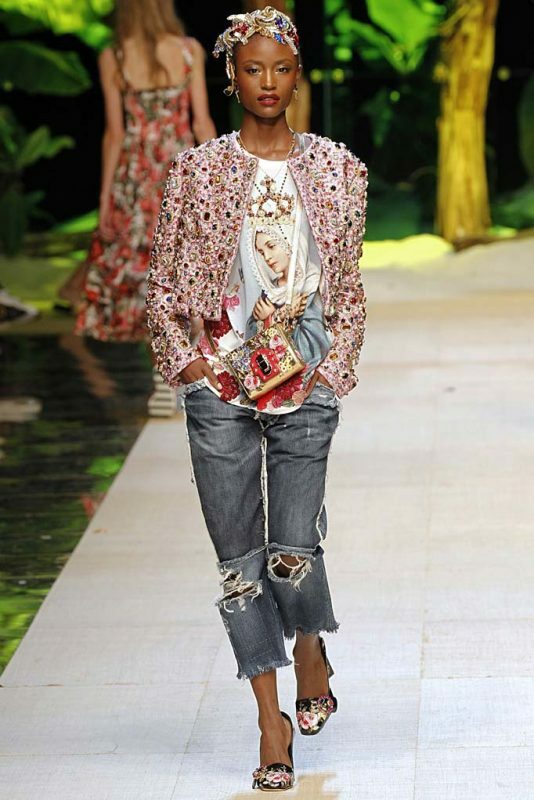 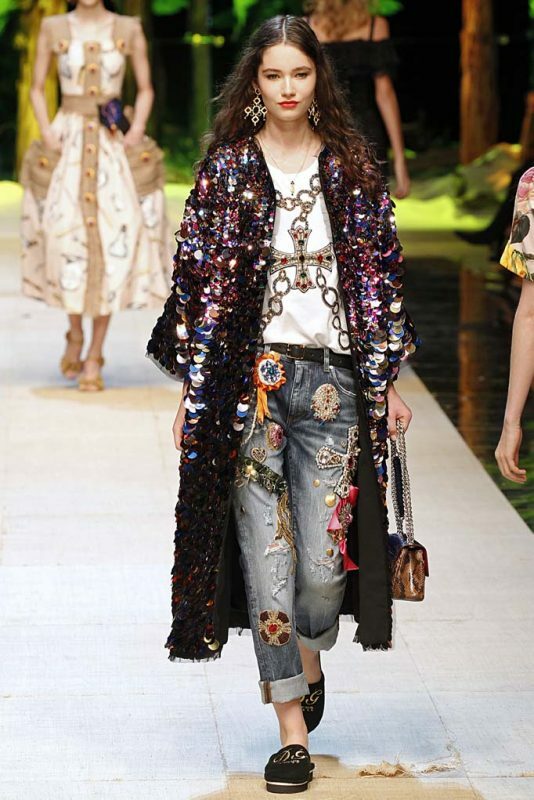 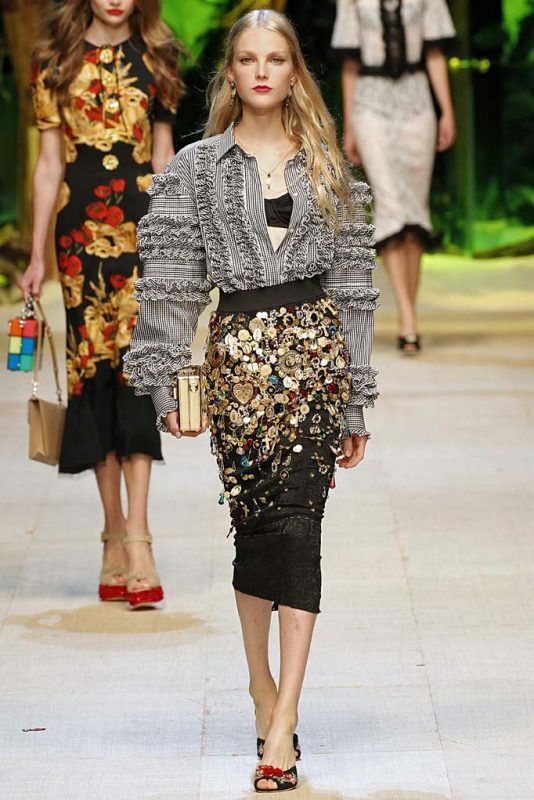 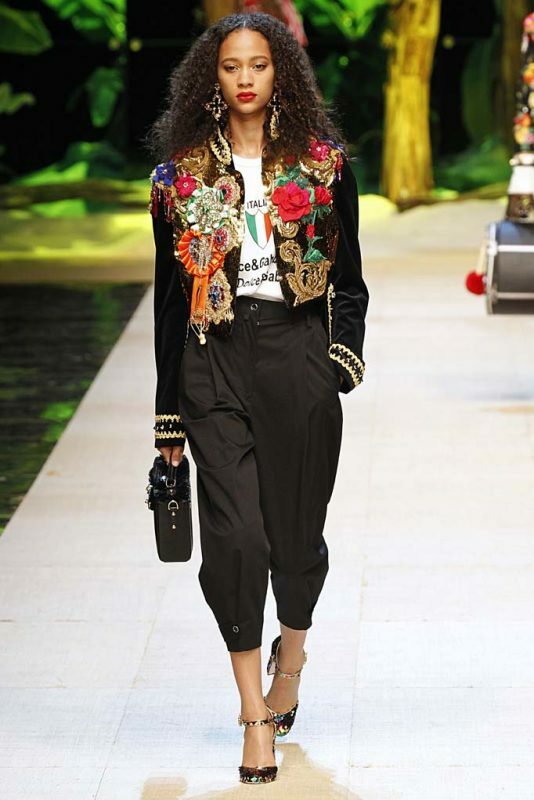 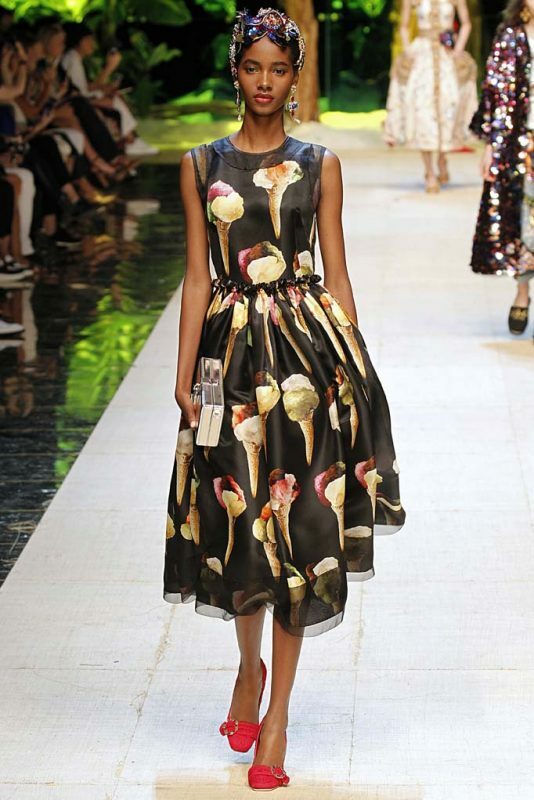 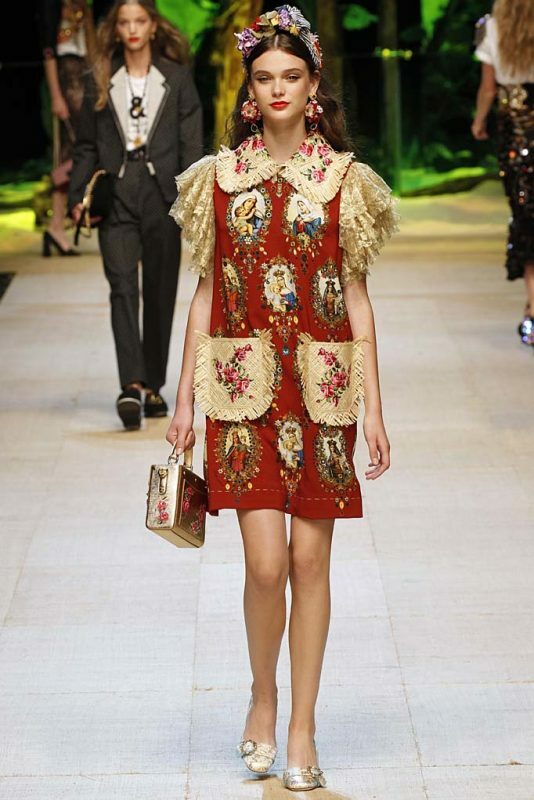 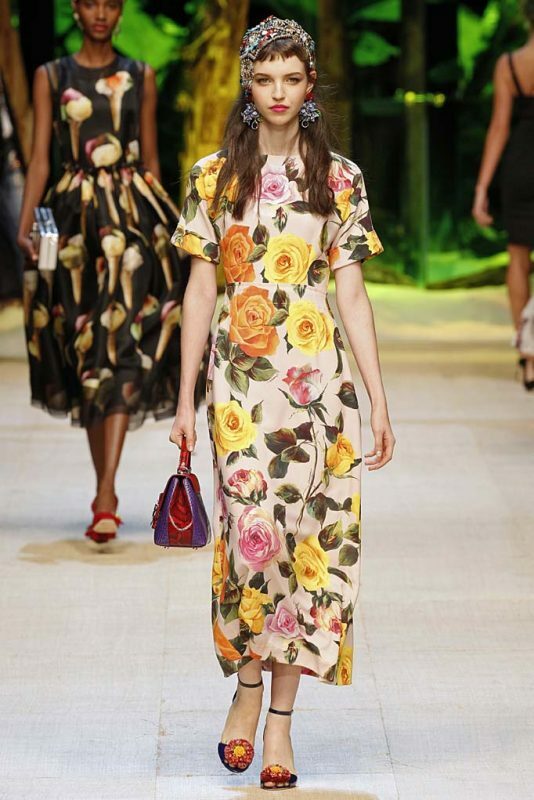 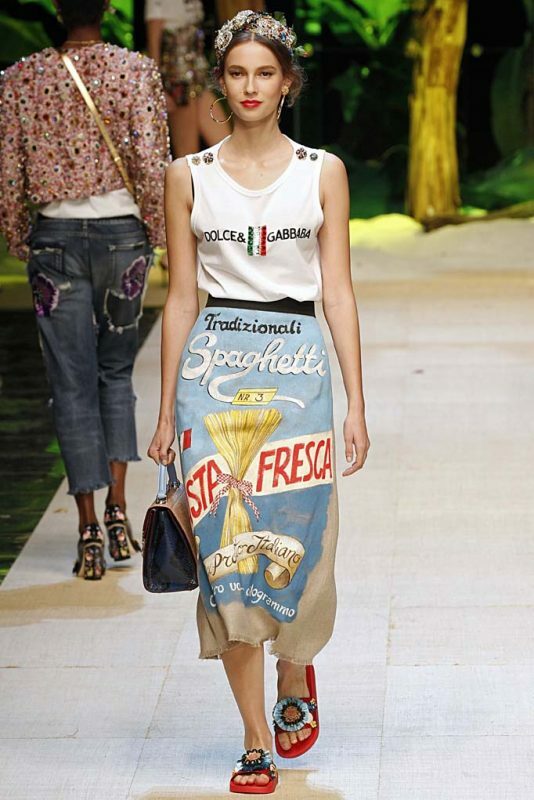 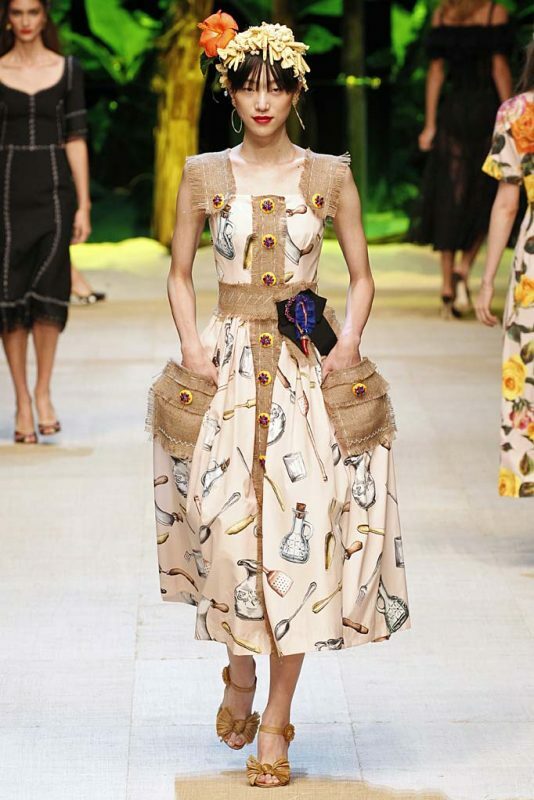 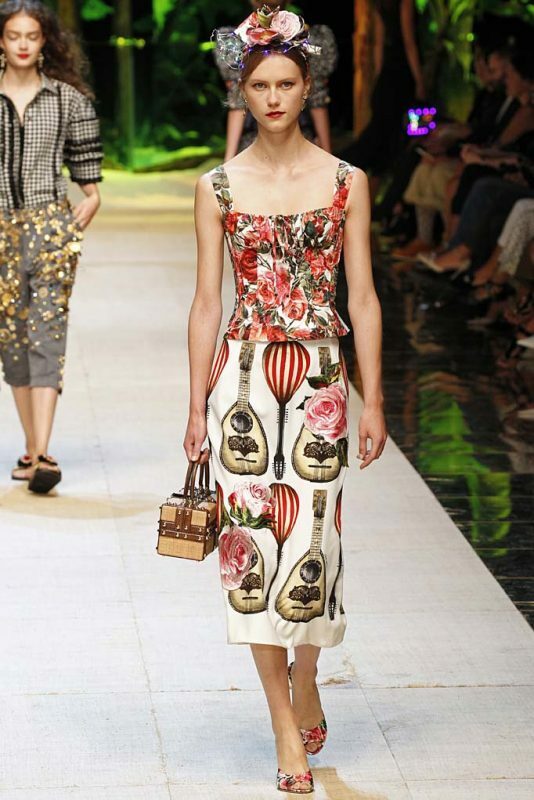 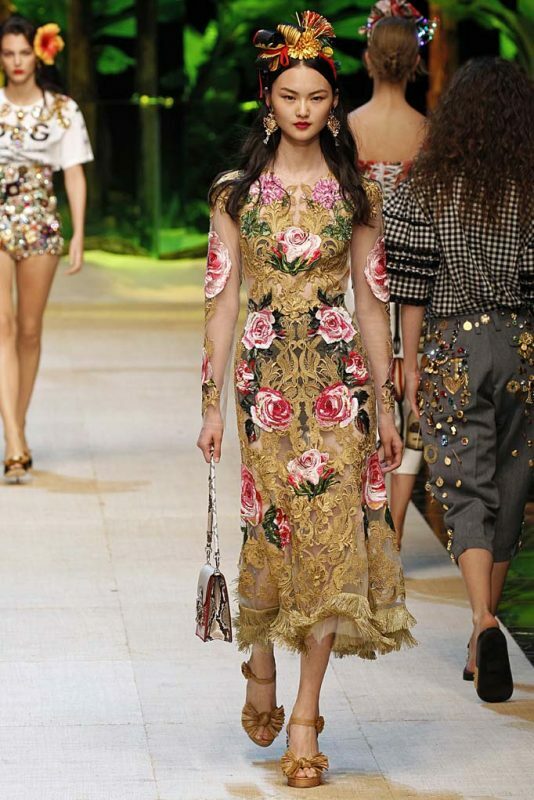 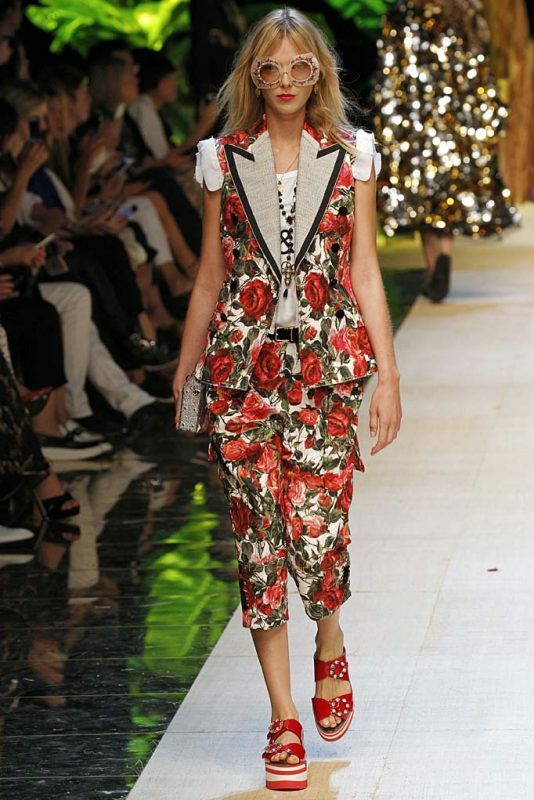 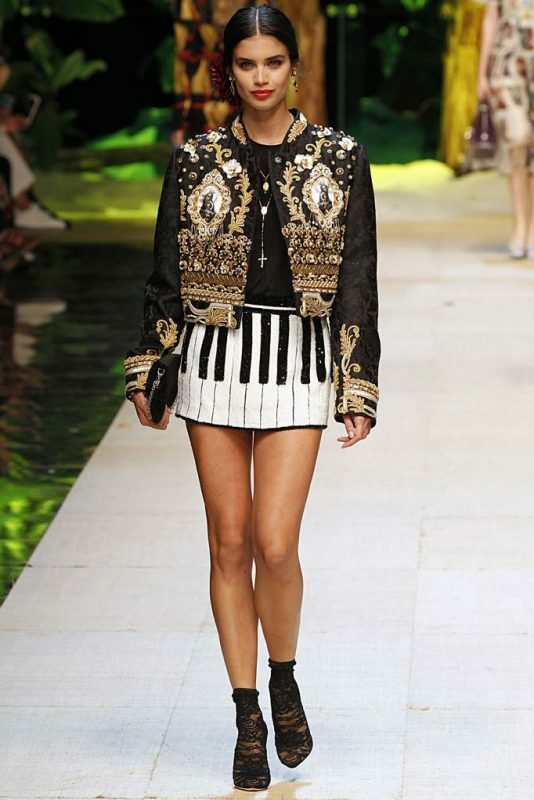 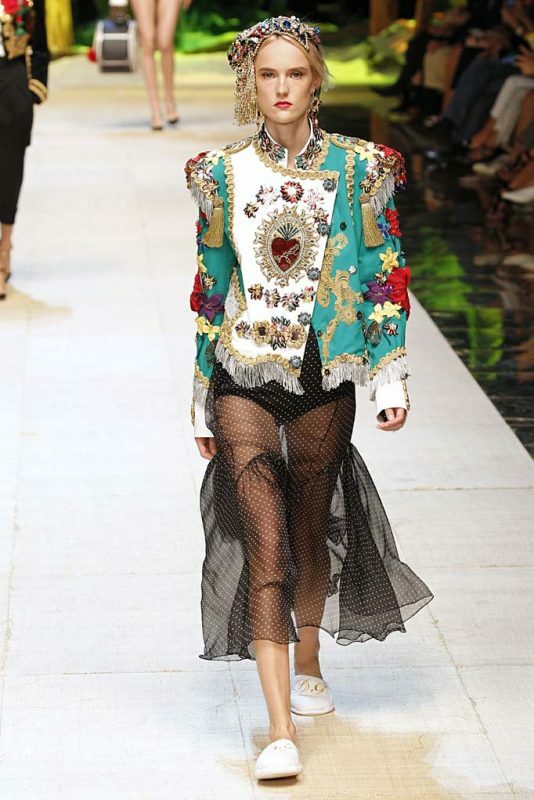 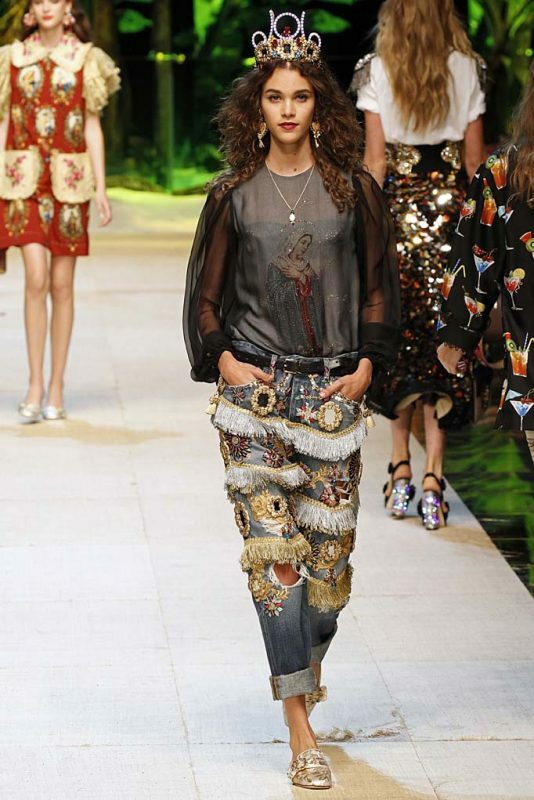 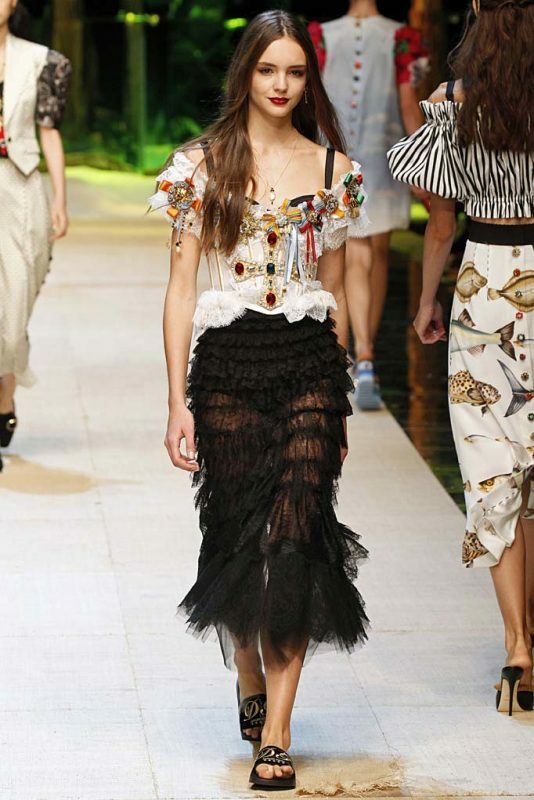 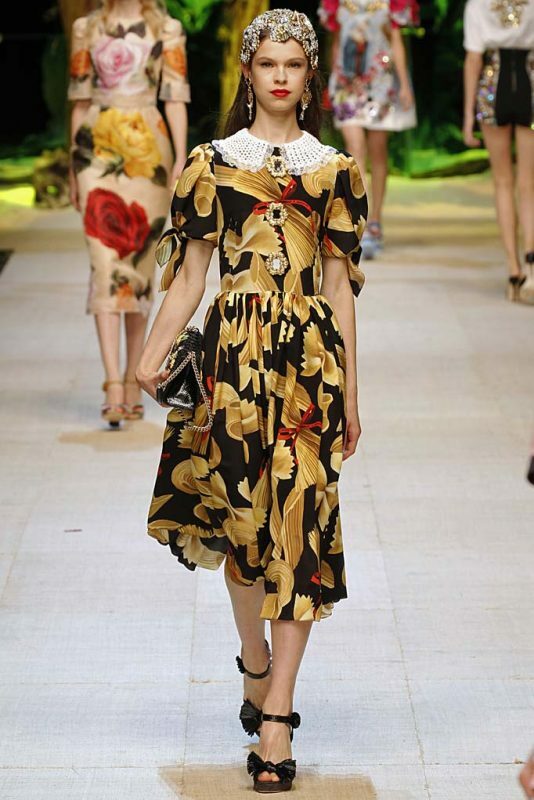 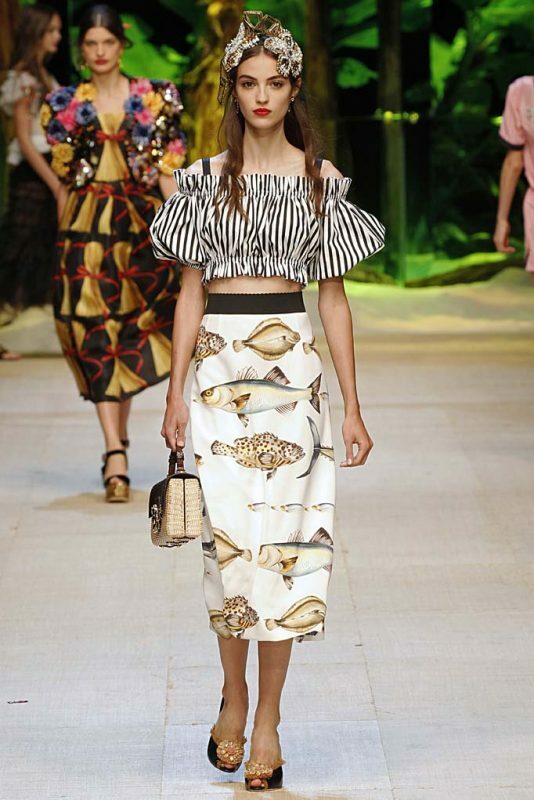 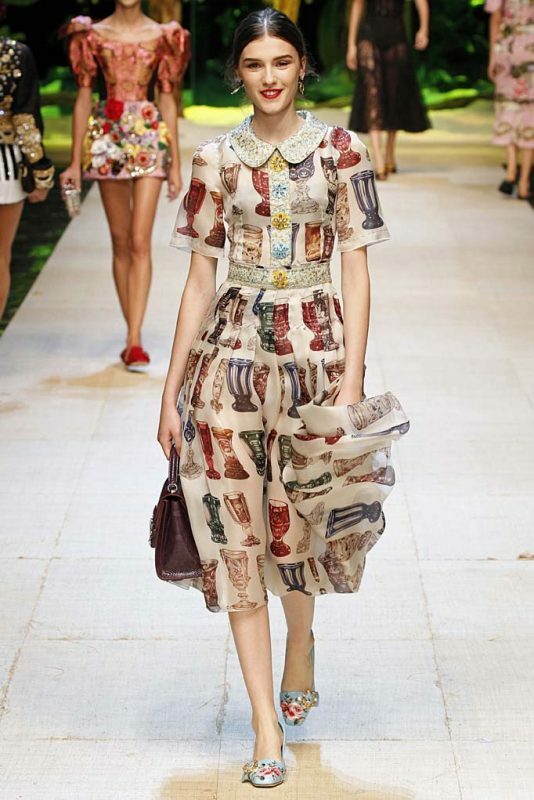 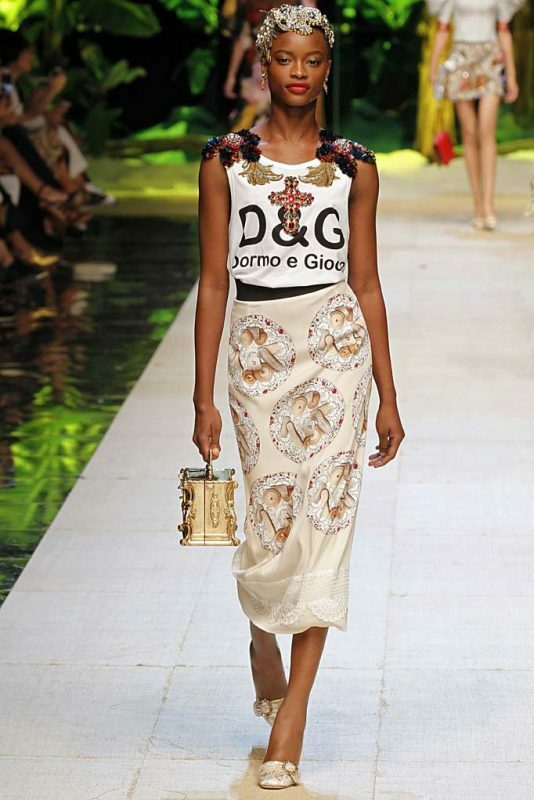 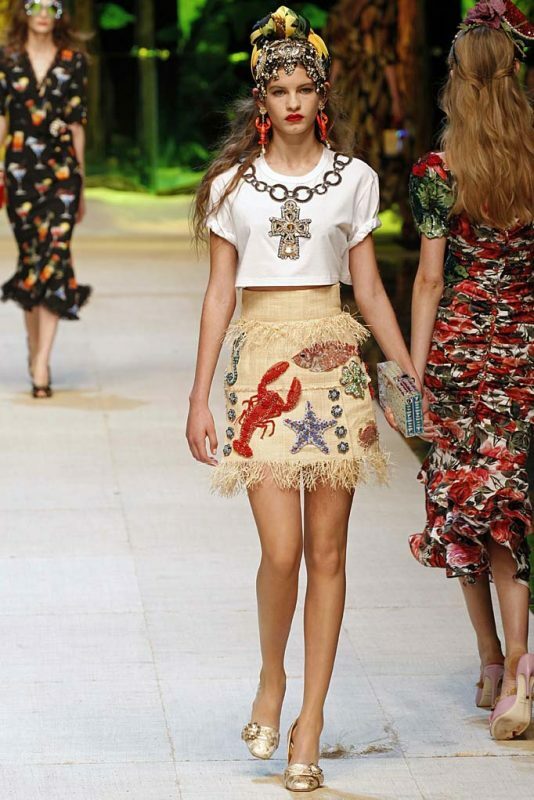 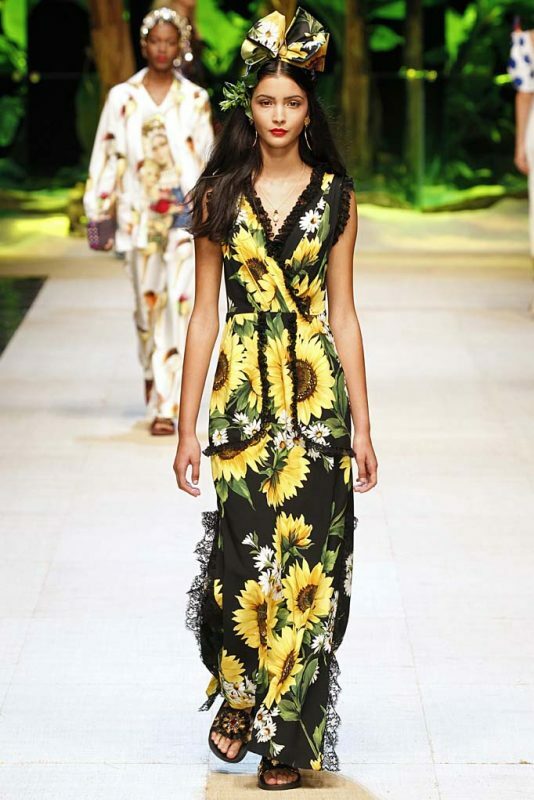 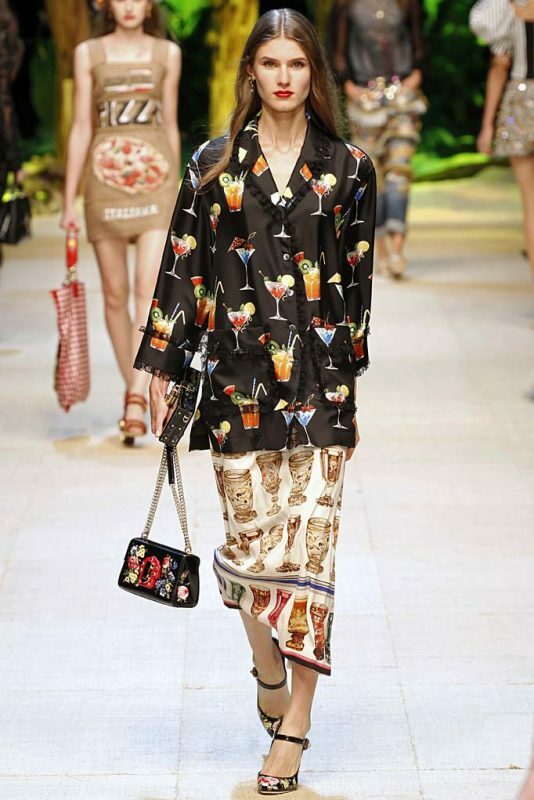 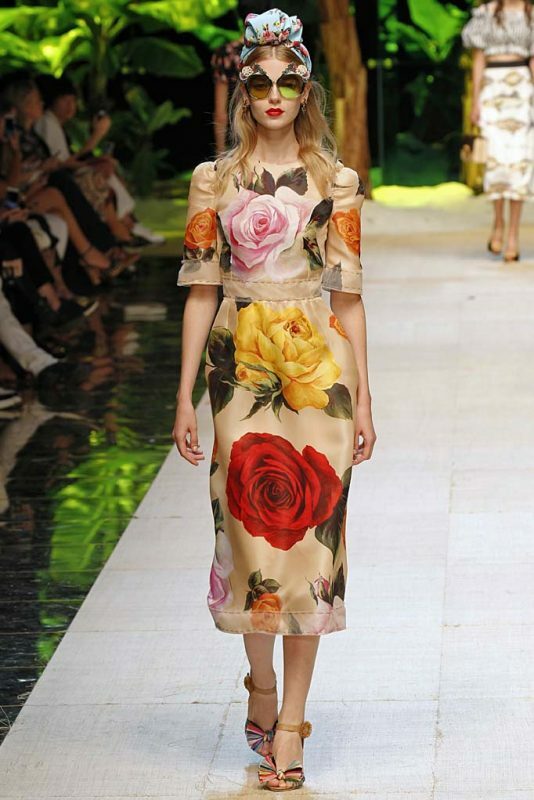 Domenico Dolce and Stefano Gabbana sure do have fun coming up with the inspirations for their collections. 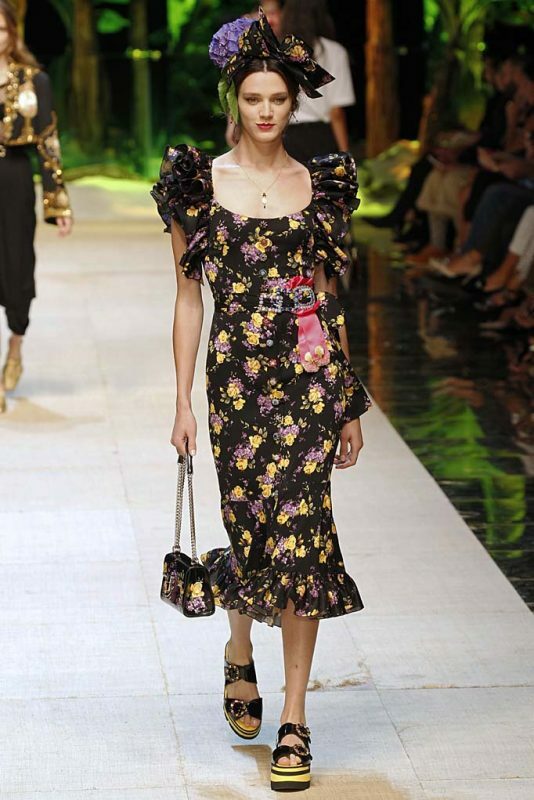 Last season they took us to Disneyland, another season they were inspired by mothers, but they first and foremost always are inspired by their country. 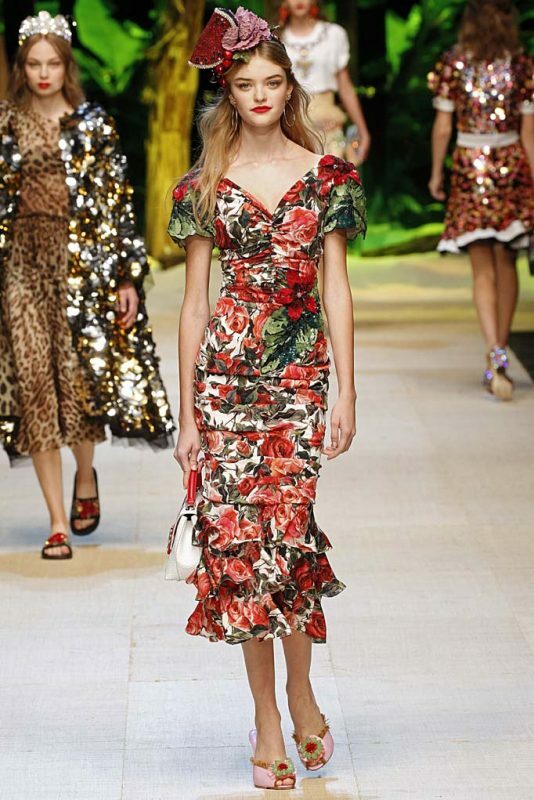 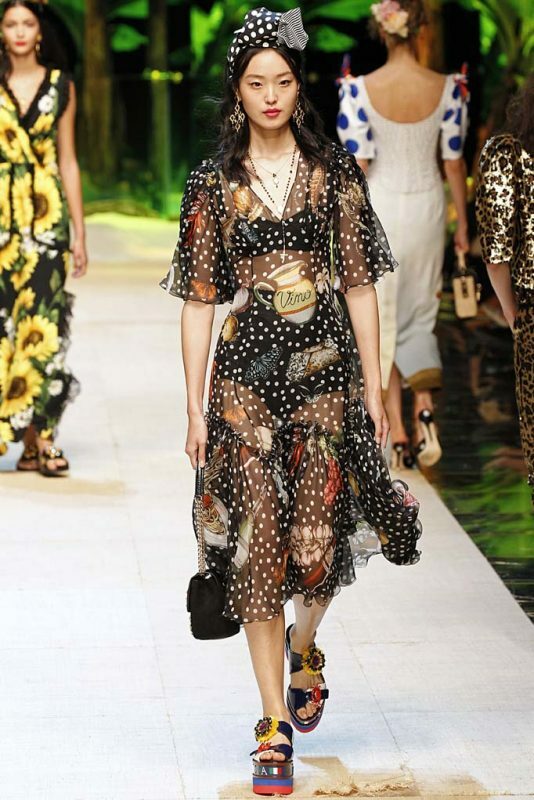 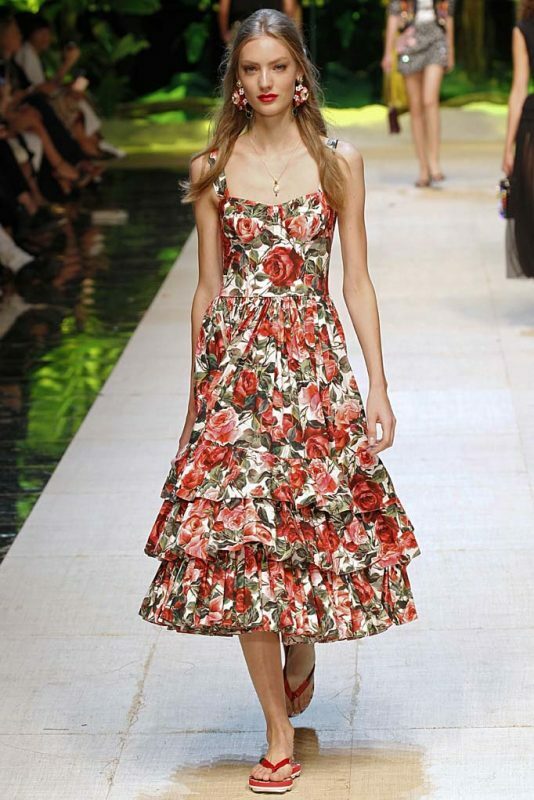 So mixed in among Dolce & Gabbana classics like a skin-tight sheer black dress worn over ’50s-style underpinnings, a leopard print suit, a corset top, and a pair of embellished high-waist hot pants were dresses with prints like bundles of uncooked spaghetti, a skirt with very realistic prints of local fish, a flour sack mini dress emblazoned with a picture of a giant pizza, and even a black evening dress came printed with large penne pasta and roses. 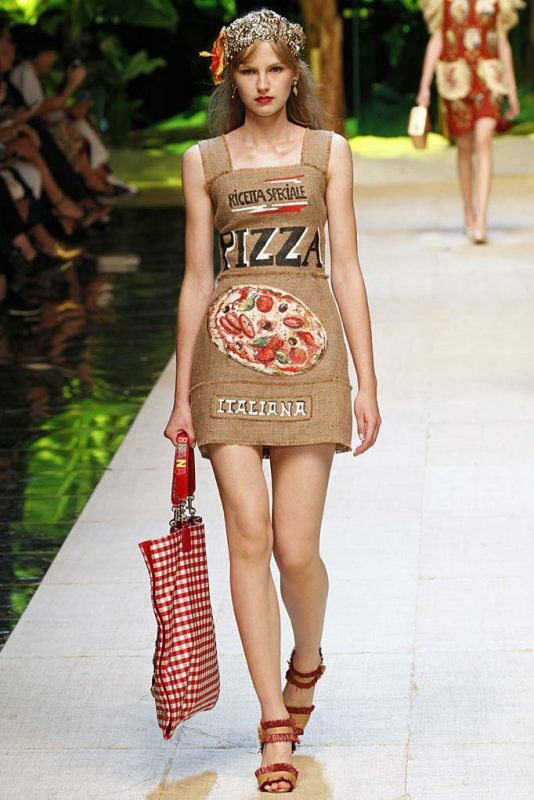 It’s so whimsical and entertaining, you don’t even think of where someone might want to wear a dress patterned with Italian cuisine! 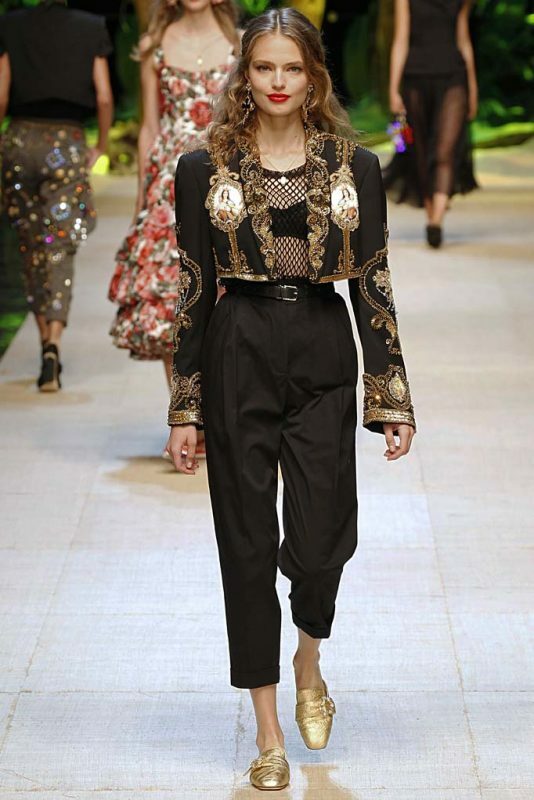 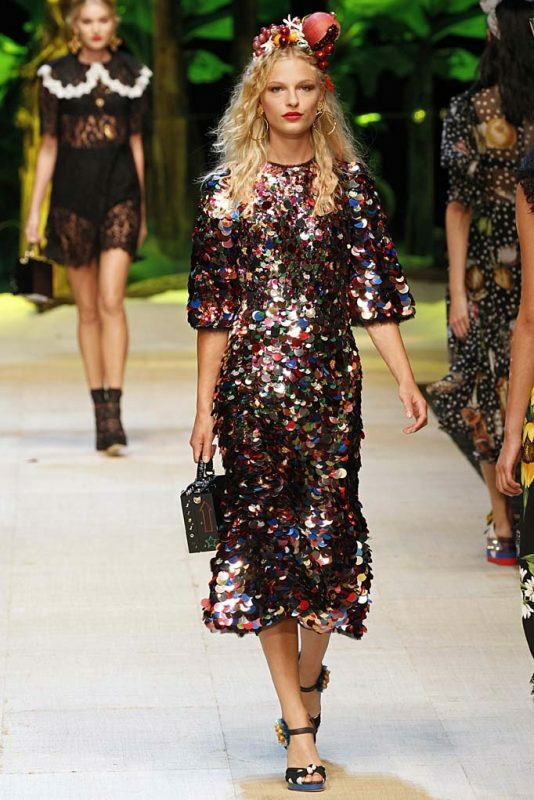 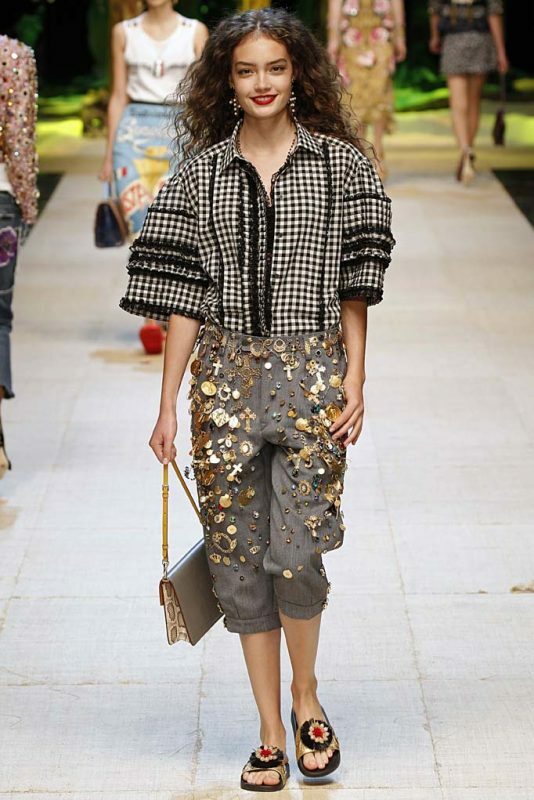 And for the girls who just wanna have fun, but want to look pretty while doing it, Domenico and Stefano brought back the heavily sequined pieces from their last collection, which have been such a huge hit. 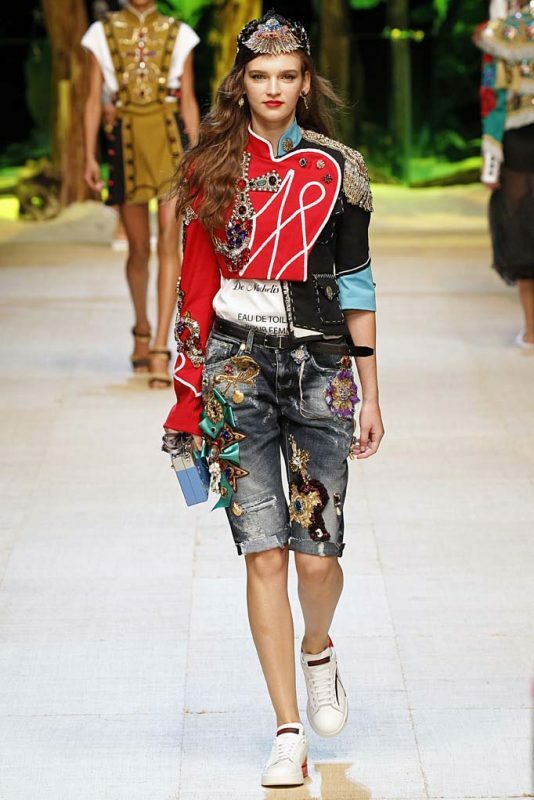 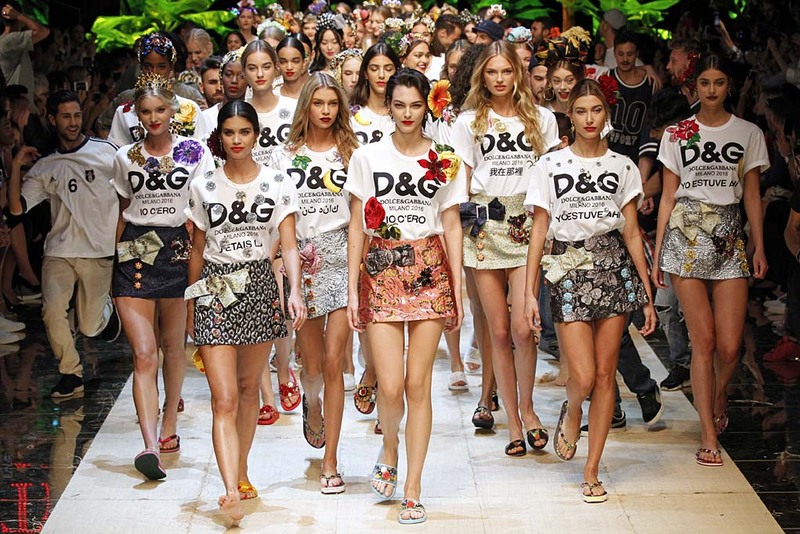 The designer duo brought 20 millennials, like Cameron Dallas and the Lucky Blue Smith clan, to the show and closed it with a performance by street dancers from Naples who performed alongside models as they trotted out in mini-skirts and D&G logo T-shirts. 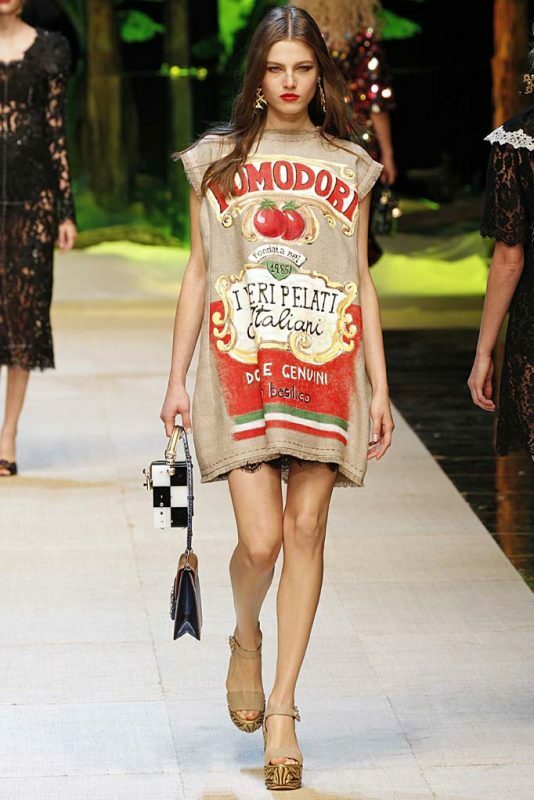 Italians certainly do not hold back on their indulgences!